In the sixth pAsuram, AzhwAr says “I have no means in me to attain you who are infinitely enjoyable; you should accept me yourself”. I don’t know the means to reach the SrImAn who revealed his merciful presence in the supreme sky, spreading the radiant, reddish light with the reddish, divine pIthAmbaram, divine feet, divine navel, divine hand, divine chest, divine eye and divine mouth which are fitting perfectly like a bluish gem with well spread, abundant bluish radiance interleaved with blossomed, radiant, splendorous lustre. Implies “You who know the means, should come here and take me there”. vandhu eydhum ARu aRiyEn – I don’t know the means to come and reach you there. When you yourself manifest your physical beauty, I should not reject it; but I cannot pursue any means and reach you. When asked “what if you lost me?”; AzhwAr responds “Is your form such that, I will lose you”. malgu neelach chudar thazhaippa – Should I give up due to lack of physical beauty in him? Should I give up due to lack of purushakAram (recommendation) to attain him? Should I give up due to lack of desire in me? thazhaippa – since it [radiance] is not acquired due to karma, it grows infinitely; it keeps growing to let us not define it within certain boundaries. sem sudarch chOdhigaL pUththu – The lustre which is having reddish radiance, blossomed like a flower which blossoms at various times of the day. oru mANikkam sErvadhupOl – To be enjoyed, like a gemstone resting. “malgu neelach chudar thazhaippa” indicates the beautiful complexion; “sem sudarch chOdhigaL pUththu” indicates the divine limbs; “oru mANikkam sErvadhupOl” indicates the divine form which is the abode for both the complexion and the limbs. It is seen here that, emperumAn‘s features are explained in a concealed manner, subsequently, AzhwAr is explaining them in an explicit manner. andaramEl … – andharam – middle portion. Middle portion for the body is waist. The divine feet with the divine waist decorated with the divine pIthAmbaram; divine navel, divine hands, the reddish divine chest which is comparable to these aforementioned limbs, due to the merciful presence of periya pirAttiyAr, divine eyes, divine mouth/lips. sem sudarch chOdhi vida – to release the lustre with reddish radiance. 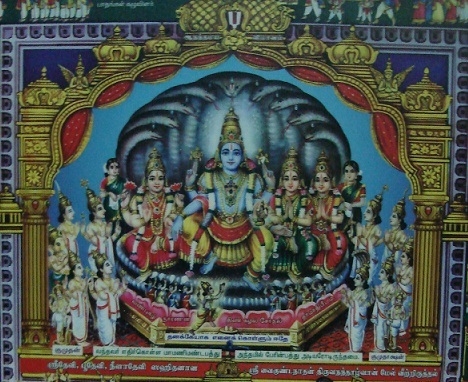 uRai en thirumArbanaiyE – this [presence of periya pirAttiyAr on his chest] also appears to be a divine ornament; one who has my lady lord, periya pirAttiyAr on his divine chest. As emperumAn mercifully reclines on thiruvananthAzhwAn (AdhiSEshan) having him as the mattress on thiruppARkadal (milky ocean) so that the water does not bother him, periya pirAttiyAr is staying on emperumAn [his chest] who is seen as a multi-coloured bed-spread. It is said SrI rAmAyaNam sundhara kANdam 38.20 “paryAyENa prasuptha:” (Due to being very tired, I was resting on SrI rAma’s lap). This entry was posted in thiruvAimozhi, thiruvAimozhi 7th centum on September 21, 2018 by Sarathy Thothathri.